The only 2011 NASCAR Nationwide Series race held outside of the United States of America, a man-made island off the coast of the Canadian city of Montreal acts as the stage for the 600-700 horsepower of stock cars. Ile Notre-Dame's Circuit Gilles Villeneuve road course provides 2.71 miles of high-speeds as well as 13 corners testing braking of 3,300 pound stock cars. Providing the knowledgeable and loyal Canadian NASCAR community with the second-ranked touring series in stock car racing organization's rich portfolio since 2007, the 2011 presentation of the NAPA Auto Parts 200 is the province of Quebec's 5th year holding the race. Each and every year, the NASCAR Nationwide Series at Circuit Gilles Villeneuve leaves a permanent mark on the North American auto racing community. However, for Canadian race fans, the 2008 race where fellow Canuck Ron Fellows won a wet and wild victory left a lasting impression on the circuit Gilles Villeneuve inaugurated with a Formula 1 win in 1978. After NASCAR Nationwide Series qualifying at the Canadian road course, the son of the track's namesake those honours as being the hometown hero. Driving the #22 Dodge Challenger for the second time in the 2011 NASCAR Nationwide Series season (first being in a rather eventful Road America event in June), Jacques Villeneuve guided the Penske Racing fielded machine around the Montreal race course in 1 minute, 35.800 seconds. The 1997 Formula 1 World Champion's first NASCAR pole position, the 40 year-old Villeneuve scores it at a very symbolic locale. Through the events the second-generation Canadian racer has competed at Circuit Gilles Villeneuve, Jacques Villeneuve's most significant victory came in Toyota Atlantic Series race in 1993. Eluded the coveted pole position in Formula 1 competition at the track, none of the 12 grand prix top trophies had been collected at the Canadian Grand Prix round. In NASCAR Nationwide competition, his best race effort came in 2009 when he finished in 4th spot. A former graduate of the Players drivers development program (an initiative that developed a multitude of Canadian auto racers to greatness in the 1990s), Villeneuve starts alongside a more recent member of the same open wheel launch pad. For the 2011 NAPA Auto Parts 200 at Circuit Gilles Villeneuve, current INDYCAR driver Alex Tagliani is partnered with Jacques Villeneuve in the Penske Racing Dodge Challengers. Penske Racing teammates for the weekend will top the front row for Saturday's NASCAR Nationwide Series event. In time comparison, Tagliani's #12 Dodge was only 0.127 seconds slower on his fastest lap than the #22 car. A race won two of the four times by a NASCAR star more accustomed with ovals, these drivers do benefit from more robust team chemistry earned across the Nationwide Series race schedule. In 3rd spot, Jason Leffler will lead over proficient road racers Scott Speed and Michael McDonnell at the start of Saturday's event. Other NASCAR Nationwide Series regulars starting near the front includes Steve Wallace in the 7th and Justin Allgaier rolling off 10th for the race. Series championship frontrunners for 2011 had a sub-par qualifying effort Friday. Elliot Sadler starts 16th in the #2 Chevrolet while the #32 Dollar General Chevy of Reed Sorenson is placed 23rd. Even behind Jacques Villeneuve and Alex Tagliani, the Canadian contingent for the 2011 edition of the NAPA Auto Parts 200 appears to be extremely strong. In the 43-car field for the NAPA Auto Parts 200, 9 of the 43 cars will be piloted by a Canadian driver. Champ car winner and one-time NASCAR Sprint Cup driver Patrick Carpentier will start 8th in an event which could be the final time the French-Canadian will race professionally. In 11th place, aspiring NASCAR star Andrew Ranger looks to top a 3rd place effort in 2009 at the Circuit Gilles Villeneuve race. As Ranger and most Canadian drivers seek a first win, 13th place Ron Fellows has already been to victory lane (at least within a garage area sheltered from strong 2008 downpour). Fellows is again competing with JR Motorsports equipment sponsored by Canadian Tire. JR Fitzpatrick will start 21st in a Canadian-owned #67 Ford for Go Canada Racing. Maryeve Default, Lous-Philippe Dumoulin and 2010 NASCAR Canadian Tire Series points champion DJ Kennington make the 43-car field with deep starting positions. Besides Canadian driver, the usually American driver heavy NASCAR Nationwide Series will also feature the prowess of the NASCAR Sprint Cup Series' latest winner Marcos Ambrose. The Tasmanian driver will be pulling double duty between Sunday's Cup race in Michigan and the Circuit Gilles Villeneuve. Foiled for victory after being a strong contender in all four NAPA Auto Parts 200 races held in Montreal, Ambrose makes a special appearance for the NASCAR Nationwide Series event continuing to hunt the road course win that has taunted the driver in previous years. The 2011 NAPA Auto Parts 200 at Circuit Gilles Villeneuve will be the first such event not to be limited to an all-male starting field. Driving the #81 Dodge from a 39th place starting position, Canadian Maryeve Default will be taking the green flag with INDYCAR star Danica Patrick who is driving the #7 Chevrolet for JR Motorsports. 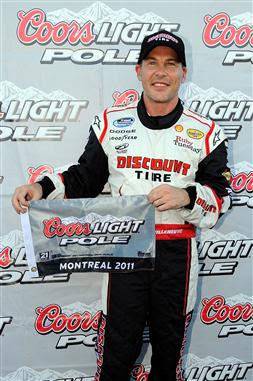 In her first NASCAR road race, Patrick acquired a 25th place start at the Montreal track. A race lasting 74 laps, the final NASCARNAPA Auto Parts 200 race will be met with temperatures as high as 29 degree Celsius with a 30 percent chance of a thunderstorms.